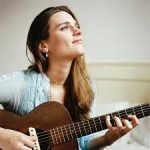 Recorded at the Parish Church of Saint Mary the Virgin in Great Milton, Oxfordshire, England,Madeleine Peyroux‘s eighth studio album, 2016’s Secular Hymns, finds the vocalist/guitarist delivering a stripped-down, largely acoustic set of warm, eclectic cover tunes. Backing Peyroux this time out are guitarist/vocalist Jon Herington and bassist/vocalist Barak Mori, both highly sought-after New York-based musicians with deep jazz, blues, and rock credits. While technically a studio album, Secular Hymns was recorded as if a live concert, a choice inspired by Peyroux‘s 2015 performance at the venue. The result is an album that’s a 180-degree turn from her previous effort, 2013’s ambitious homage to Ray Charles, The Blue Room. Where that album framed Peyroux‘s earthy vocals in organ, electric guitar, horns, and a lush orchestra, Secular Hymns feels like you are sitting in the front row of an intimate Peyroux concert. Here, Peyroux eases into the session, kicking things off with a supple, harmonized, Western swing-tinged take on John Greer & the Rhythm Rockers‘ 1951 side “Got You on My Mind.” She then struts through Tom Waits‘ “Tango Till They’re Sore,” imbuing the song with a wry sensuality that’s equal parts Billie Holiday and Marlene Dietrich. Despite the acoustic, minimalist nature of the production, Peyroux still manages to defy expectations, offering up a delicately swaggering take on Allen Toussaint‘s “Everything I Do Gonh Be Funky (From Now On)” and transforming Linton Kwesi Johnson‘s reggae anthem “More Time” into a something that sounds improbably like Eartha Kitt doing a cabaret homage to Bob Marley. Thankfully, it works, as do other selections including her more traditional readings of songs like the swinging Sister Rosetta Tharpe number “Shout Sister Shout” and her folky, sad-eyed version ofTownes Van Zandt‘s “The Highway Kind.” Particular effective is her bittersweet take on Stephen Foster‘s parlor song “Hard Times Come Again No More.” A poignant rumination on life’s inequities and hardships, particularly those visited on the less fortunate in society, the song is a perfect fit forPeyroux‘s throaty, highly resonant voice, an instrument that has only ripened in the decades since her debut.